First of all - let me say OH MY GOSH! Have you ever SEEN a fortune cookie so BIG in real life?! 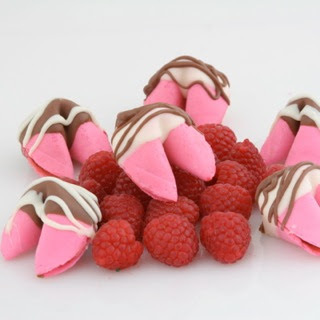 FancyFortuneCookies.com offers a wide variety of fancy fortune cookies. From chocolate covered to blueberry, they have it all! These fortune cookies make great wedding favors, corporate gifts, as well as anniversary favors! Why Should You Choose Fancy Fortune Cookies? The Fortune Cookies are baked fresh in THEIR bakery, Fancy Fortune Cookies are members of the Better Business Bureau, and you can get the sayings inside the cookies Personalized! Need more reasons?! Fancy Fortune Cookies has been in business for 20 years and they are a family company! 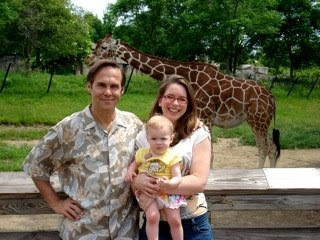 This means they can take their daughter (pictured above with the owners) to work with them! Oh... I'm jealous! My favorites were the Chocolate Covered (of course!) and the Blueberry! I'm a sucker for anything chocolate and blueberry comes in close second! These were so good and the sayings inside truly amused us! FancyFortuneCookies.com has graciously donated a $75 Gift Certificate for one lucky winner! 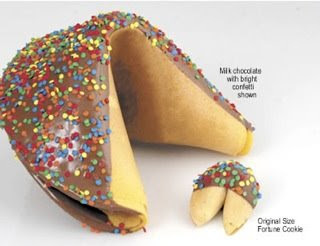 Go to FancyFortuneCookies.com and tell me which kind you would most love to try! This giveaway is open US and Canada and it will end on 7/22/09 at midnight EST. I will announce the winner in a blog post here at A Simple Kinda Life on the 23rd. The winner will also be emailed. The winner will have 48 hours to respond to my email or I will have to choose another winner. Why Milk? Here's Why: Drink Well. Live Well. Update: PakNaks Review now is a Giveaway! Demographics Survey: I Need YOUR Input!